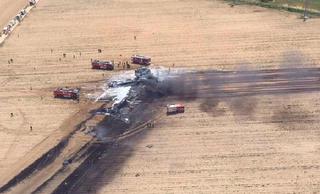 Airbus has confirmed that one of its A400M transports has crashed near Seville, Spain. The huge turboprop was on its first check flight after assembly and was scheduled to be delivered to the Turkish Air Force in June. Four out of six people onboard are confirmed dead, two others have been taken to the hospital with serious injuries. This is the first crash of an A400M, although the aircraft’s developed process has had its fair share of long delays and cost overruns. So far, 174 of the big cargo planes have been sold, with a price tag approaching $175M each. Airbus is fully aware that without further orders, and many of them, the A400M program will be a loser for company. The aircraft lost today was just serial #23. The A400M has cargo capabilities between a C-17A, which is now out of production, and a C-130J. Seeing as the aircraft’s development was largely out of the way, the company was looking to aggressively market the aircraft internationally in an attempt to make the program profitable. As of now, the Royal Air Force, the French Air Force and the German Air Force have all grounded their small A400M fleets as a precaution. Just like in an airliner crash, the aircraft’s flight data and voice recorders will be key in understanding what went wrong, along with the crash scene investigation and personal accounts.